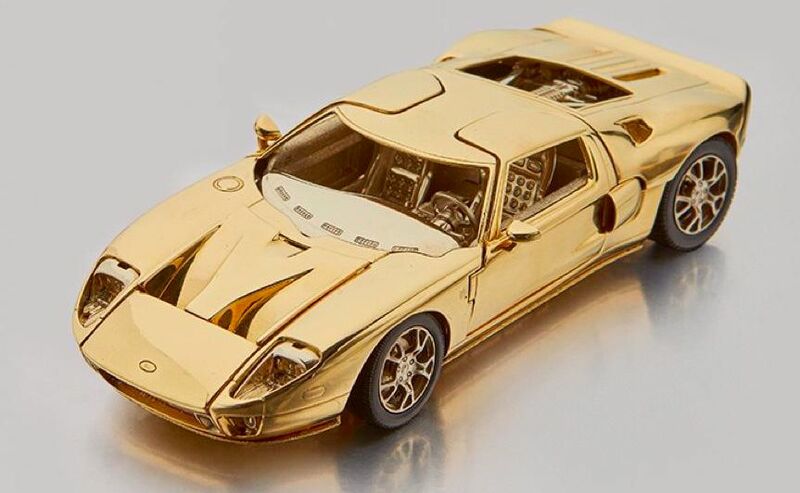 Sotheby's Auction House will conduct online bidding on a miniature copy of the Ford GT 2006, made from 2-color 18-carat gold. A collectible model developed to order one of the descendants of Henry Ford. The machine has opening doors, trunk, engine compartment, and spinning wheels. The first generation Ford GT was released on the 100th anniversary of the Ford Motor Company. The exterior of a mid-engined sports car resembles the historic GT40, which has been the triumph of the 24 Hours of Le Mans 4 times in a row. The contractor Mayflower Vehicle Systems assembled 4038 such 2-doors. Painted cars in the company Saleen.